Autumn approaches and the poncho trend from last spring is revived as the days grow cooler. 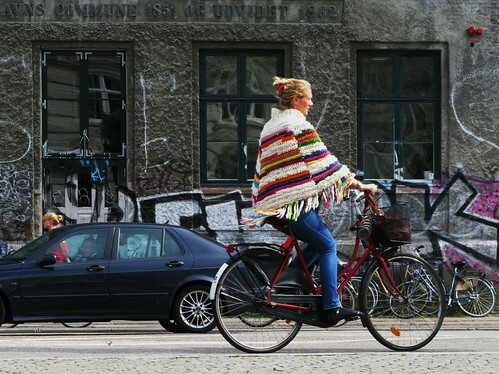 Here's a colourful version flowing past on St. Hans Square in Copenhagen. Wifealiciousness knits her own ponchos out of pure Icelandic wool and she sells them on her website Modler.dk [Danish language] if anyone in Greater Copenhagen fancies one. As Vince on the British show The Mighty Boosh says, "It is impossible to be unhappy in a poncho." The Clint made them a style icon in his spaghetti westerns - around about the time this funky Copenhagener was a youngster. Poncho takes a comfortable look. Dont forget that martha stewar wore one when she left prison, do you want to be like her? probably not! Love the poncho. My, your wife has style. 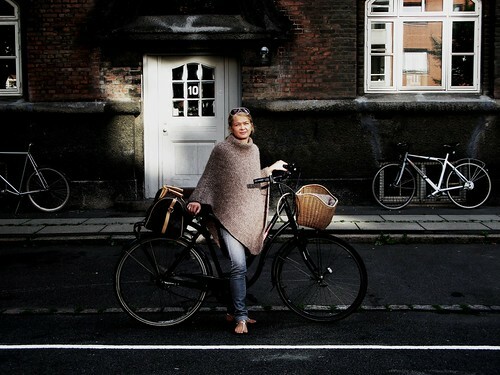 Where did she find her wicker bike basket? What kind of bike (it looks electric) is old-school funkalicious riding ? raquel: martha stewart is not a cultural reference we refer to in this country... :-) nobody knows who she is, thank goodness. karen: the basket is standard, run of the mill gear. available in every bike shop and supermarket. no name. this model was a a blockbuster among the italian teenagers since 1968. Its name is "Ciao" manufactuerd by Piaggio , in Pontedera. 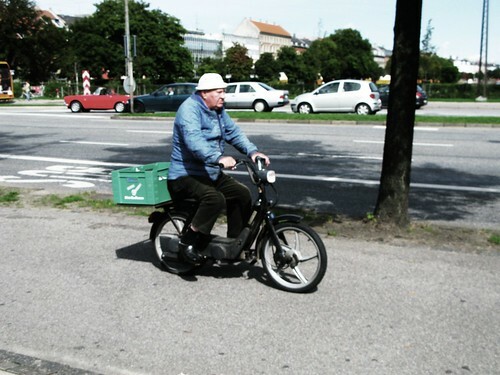 Now is very popular in Rumenia, because their local law doesn't tax all the veicles with pedals. Your wife is so talented and beautiful. I'm glad poncho is still in in DK. In Canada, no one wears them anymore so I put mine in the closet.